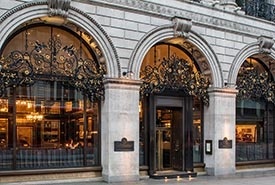 Combining British heritage with European grandeur, The Wolseley is one of London's most iconic all-day café-restaurants. The Grade II listed building maintains many aspects of its original design and the restaurant today is renowned in part for its spectacular interior. Very much in the European grand café tradition, the menus encompass breakfast through to late evening snacks, with an emphasis on immaculate presentation and seamless service. Inspired by the grand cafés of Mittel-Europe, The Delaunay is an all-day café-restaurant located near Covent Garden on the corner of Aldwych & Drury Lane. It offers a varied selection of classic European food for breakfast, lunch, afternoon tea and dinner and is perfectly positioned for enjoying a meal before or after a nearby theatre performance. 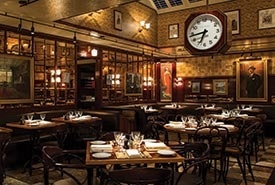 The Delaunay Counter - a traditional Viennese café, sits adjacent to the restaurant and offers a selection of food and drink to eat in or take away. A traditional Viennese café, adjacent to The Delaunay, offering a selection of pastries, cakes, sandwiches, soups and salads, to eat in or take away. 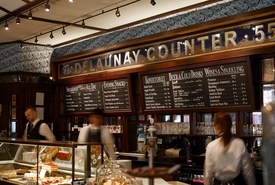 The Delaunay Counter's relaxed atmosphere is reminiscent of typical Mittel-European cafés, serving simple but exceptional food, prepared daily by The Delaunay chefs. Open for hot drinks and viennoiserie, breakfast and lunch, along with wine, aperitifs and light snacks well into the evening, no reservations are required. 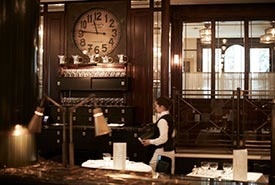 A grand, bustling Parisian brasserie with an authentic Art Deco interior, Brasserie Zédel is open daily until midnight. 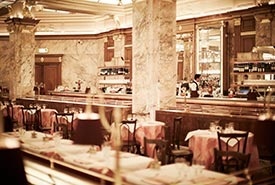 Hidden away in the heart of Piccadilly, it serves traditional French food at remarkably good value. Along with the Brasserie, the building also plays host to the ZL Café - a relaxed pavement-level café open from morning 'til late, an authentic American Bar - Bar Américain, and The Crazy Coqs, a live music and cabaret venue. 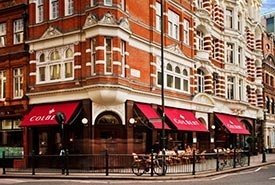 Inspired by the great boulevard cafés of Paris, Colbert is an informal neighbourhood rendezvous on Sloane Square. Proudly positioned in the heart of Chelsea, it offers a classic Parisian all-day café menu and is equally popular for a pre- or post-theatre drink. With pavement tables at which to watch the world to go by on warmer days, Colbert is open from breakfast until late, seven days a week. Neighbourhood favourite, Fischer's, is an informal restaurant and café warmly evocative of Vienna in the early 20th century. A classic Viennese café menu is offered throughout the day, including an extensive choice of salads, schnitzels, brötchen, strudels, biscuits and hot chocolate. 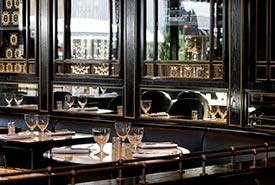 Found at the top of Marylebone High Street, Fischer's buzzes from breakfast through to dinner, seven days a week. 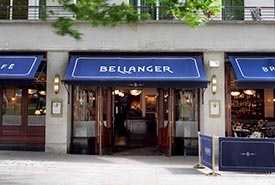 Bellanger is a traditional French brasserie and grand café in the heart of Islington. A relaxed, informal dining space and bar pay homage to the golden era of the grand café with food inspired by classics from Alsace with both French and German influence. Live music plays every evening and there is an outdoor terrace overlooking the green. 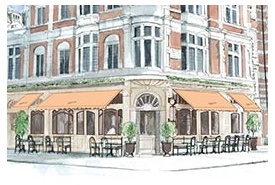 Café Wolseley at Bicester Village is Corbin & King's first venture outside London. Taking reference from the London flagship, it serves breakfast, lunch, afternoon tea and dinner with the menus featuring Wolseley classics together with new additions. Alongside the restaurant, there is a a dedicated space for The Wolseley Shop allows customers to 'take The Wolseley experience home'. In spring 2019, Corbin & King will open Soutine on St John's Wood High Street. Similar in many ways to Colbert, the informal neighbourhood rendezvous will take inspiration from the great boulevard cafés of Paris. Located in an impressive period building, the front room and pavement will offer relaxed café and bar seating, leading to a slightly more formal space at the rear. The restaurant design is heavenly influenced by the area's strong artistic heritage and to celebrate this history, the space will evoke the Arts and Crafts Movement whilst taking visual cues from its Edwardian architecture.